Black Hammer #1 Director's Cut review – AiPT! If you have any interest in comics or writing, this isn’t one to miss. 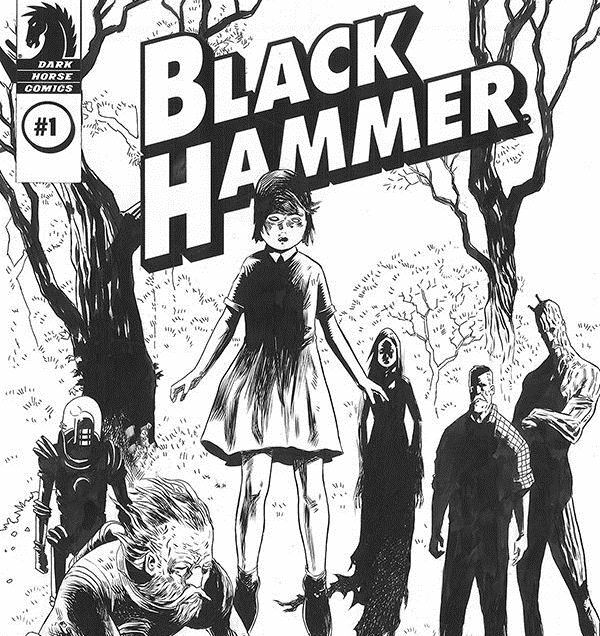 Black Hammer. You’ve probably heard of it recently. Starting off as a solo series before giving rise to a whole slew of spin-off titles, it became ground zero for an entire superhero universe spanning generations. Whether it be the antagonistic side via Sherlock Frankenstein or the heroes of the future through The Quantum Age, it’s an expansive and rich world with a great sense of lived-in history. And it all began here, in Black Hammer #1 which came out a while ago, and yet it merely feels like yesterday that it did. It’s a grand achievement worth celebrating and digging into and the much needed and deserved Director’s Cut is here to help with that. It’s fascinating to revisit this early issue now, with all the additional context of what it was doing and what it would truly go on to accomplish. Jeff Lemire’s script is packed with clever little details and tidbits, from envisioning Abe Slam as an older Paul Newman to the usage of the 9 panel grid to pack in a lot of content to hook readers. It’s a fun dive into the mind of the creator from whose mind so many rich and interesting concepts and worlds have sprung. And beyond that, it’s also really informative to look at his comic scripting style and format. Despite there being some very broad basic guidelines, everyone has their own specialized way of doing it and seeing a writer’s distinct approach never ceases to be astonishing. While being specific enough to guide and inspire the artist, he leaves enough room for his collaborators to pitch in and bring their own take, noting that his art suggestions are simply that — suggestions, and if the artist has a better idea, they should absolutely go with them. But again, that’s just the tip of the iceberg with all the lovely nuggets buried within the script. Dean Ormston’s artwork for the first issue is also showcased here in all its pure black and white glory, which is a delight. At their best, black and white comics, due the absence of color, force the reader to interpret and engage with the work more deeply and also allow for more ambiguity to exist easily. That can lead to a different reading experience and one that can at times be far more intimate, with the reader participating relatively more in the interpretation of the work and its contents, down to every detail. There’s a lot more to project onto the work, based on person to person. That benefit is certainly evident and present here, as this makes for a slightly different but interesting reading experience compared to the colored product. It also helps that Ormston’s pencils and inks are fantastic and the black and white parents only emphasize the true effort and skill Ormston put in, which can at times be taken for granted. His use of shadows and negative space whenever he gets to really dig in is very elegant and he carefully manages his blacks to light up scenes carefully and accentuate the right things to draw readers in. The textured detail for his relatively minimalist cartooning style is also spectacular and we get to study that as well. Klein’s letterering overlays on the black and white are also nice to see here, fitting in perfectly, as they do in the regular version of the book. In a lot of ways, being able to see the uncolored roughness, all the differing brush effects and the inked pencils make Black Hammer feel all the more effective. The sort of roughness fits with the crude world of the comic and enhance that aspect, which is a really nice touch. Being able to see all the clear crosshatching, the different way each elements of a scene were drawn are also really rewarding, for no matter the audience. Black Hammer #1 Director’s Cut is a terrific retroactive look at of one of the most important independent titles of the decade. Lemire, Ormston and Klein’s breathtakingly fresh new look at the realm of superheroes is as thrilling as ever and only gets better when revisited. This Director’s Cut is an absolute must-have for every fan of the franchise and the creative team. But even aside from that, it’s an educational and informative behind-the-scenes look at the process behind one of the best comics in recent years. If you have any interest in comics or writing, this isn’t one to miss. But even if you don’t, if you’re merely looking around wondering what all the fuss is about and need a good story, this is the book to grab. You’re in for a wild trip once you get to the Hammer farm.